Out of all the curtains I’ve purchased for my home through the years, I think these may be my favorite purchase to date! 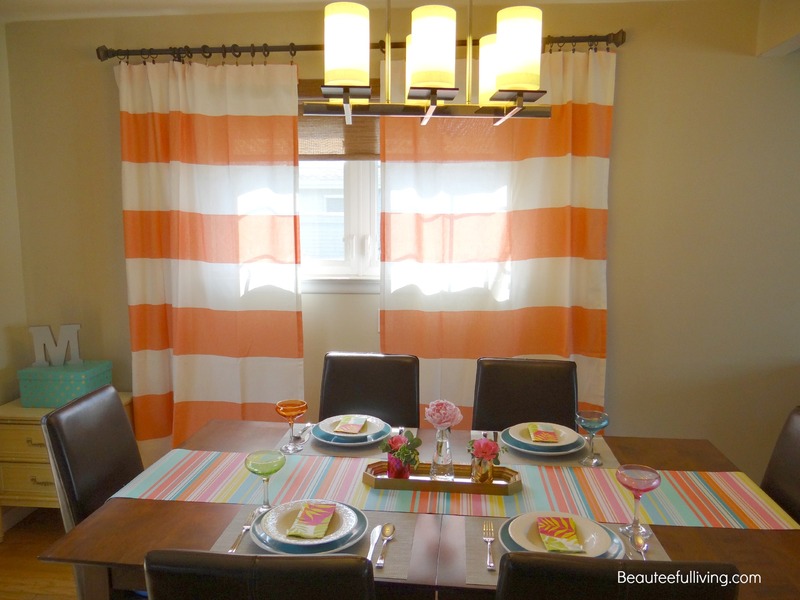 At first, I was worried that the coral and white striped curtains would be too eye-catchy for our dining area but after 5 minutes, I knew these curtains were staying put! 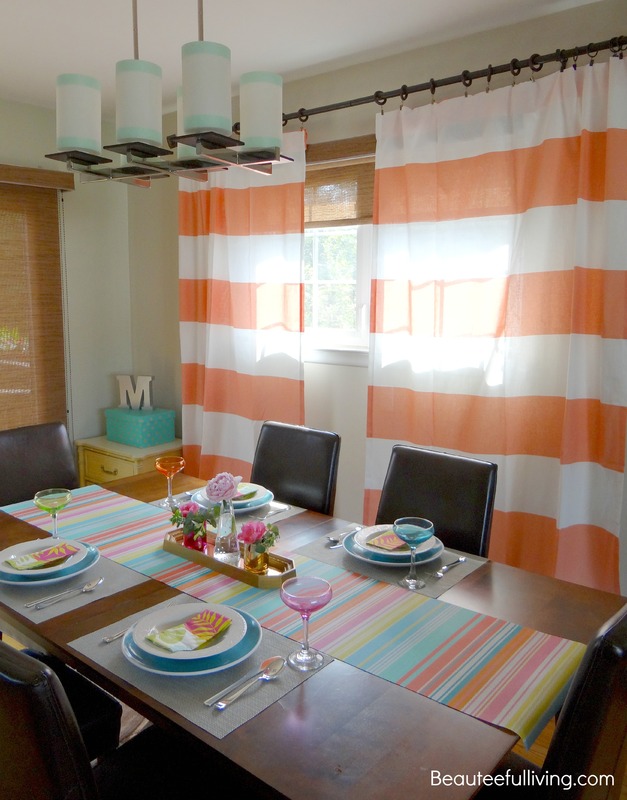 Without these curtains, the summer tablescape I created would not have been the same. I purchased them from Home Goods. You’ll notice that our pendant light is unlit in the photo below. You can see the pendant shades much better when unlit. The “turquoise” rims on the shades were created with Scotch Expressions masking tape. They peel off easily! I have a habit of customizing the look of the shades based on the occasion. You can see examples here and here. I purchased this pendant from West Elm several years ago. I purchased this runner from Target a few weeks ago. I love all the happy colors on this runner and especially because the turquoise and coral stripes went perfectly with my curtains and dinner plates! 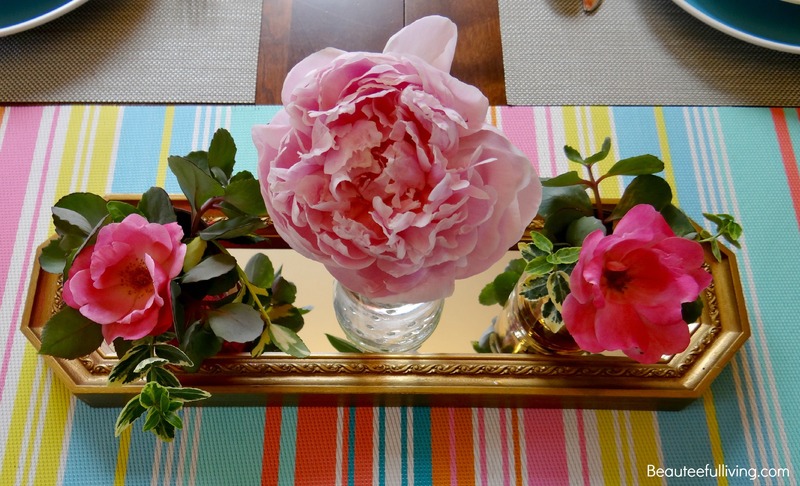 This runner was certainly a key component in my summer tablescape. 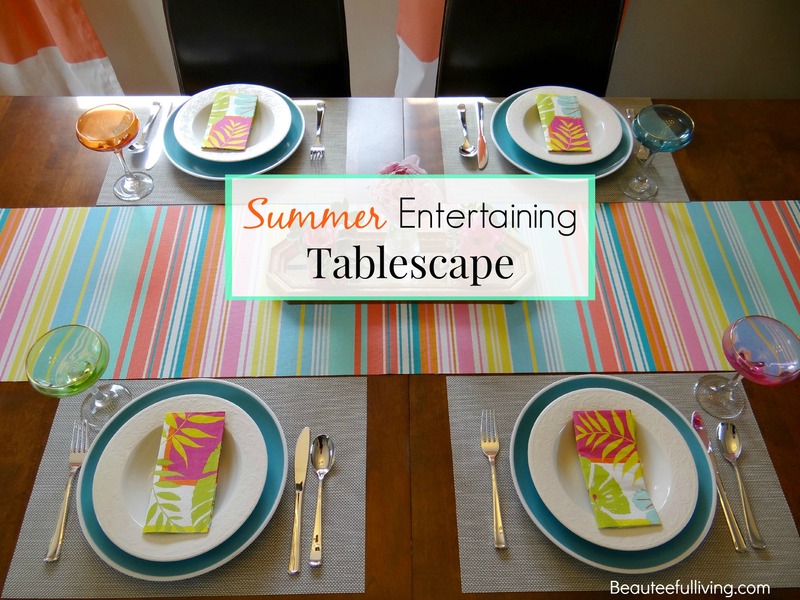 The best part of creating this summer tablescape was using items that I already owned at home! I’m still loving my Lilly for Target drinking glasses. 🙂 The turquoise plates I used were melamine plates. They are awesome because they are unbreakable! I paired them off with my white porcelain salad plates. When it comes to centerpieces, you cannot go wrong with flowers. The flowers and plant clippings in photo below all came from our garden. Too bad peonies aren’t readily available in the summer. Hydrangeas and roses make great substitutes. For this look, I placed my vases on top of a vintage gold mirror. Can you believe I paid $1.00 for this mirror at a flea market? Best purchase of the month! 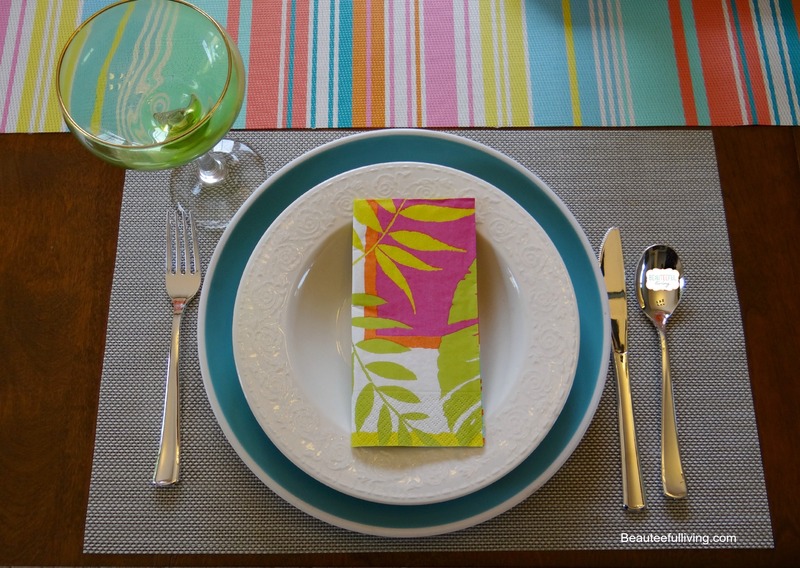 Did you have a favorite element from my summer tablescape? Bookmark or pin this post for future reference. Stay tuned for Friday’s guest post where there will be a DIY project related to summer entertaining! 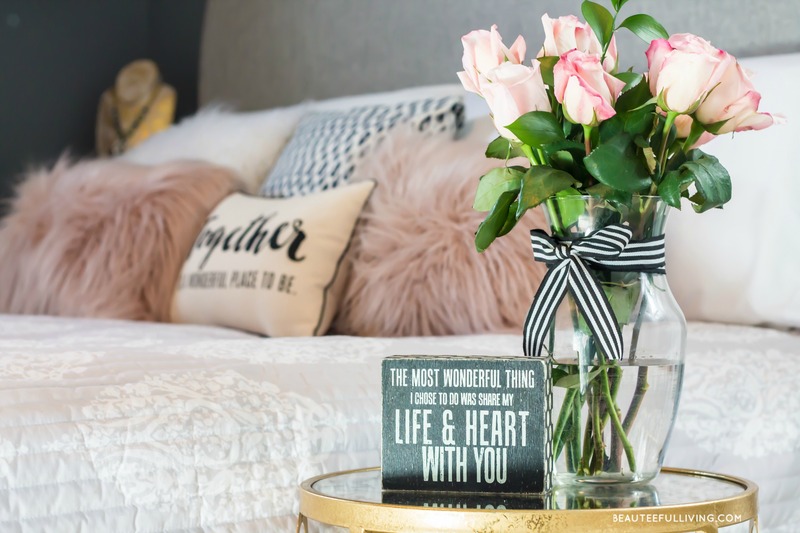 In case you missed Monday’s guest post from Mom Home Guide, you can find it here. Xo, Tee. I love the color combination. The set up just makes me feel light and airy. Beautiful! Love all of the gorgeous colors you used! So pretty!! Look at those bright colors – so perfect for summer! I love the coral and aqua together!! This is the perfect mix of summer colors…great job! So pretty! Those curtains rocks. Love the napkins!!! Great job. I just love your summer tablescape and your pretty dining room! I am loving this blog hop! This is beautiful! I love the colors you chose. That pendant light is cool and I love how easy you made it with the utensils. Thanks, JcCee. Appreciate your feedback! This is such a bright and festive space! I love it! Beautiful table! I love how bright and warm the colors are! Perfect for the summer!